The last time we saw the Prophecy family, they had just cast Beezus, a brother of Satan, into the pit of Hell and and had taken refuge in their mountain hideaway to ride out the Tribulation and await the return of Jesus, when they could all escape this mortal coil and ascend to Heaven. Or so they thought. It’s hard to tell for certain. But it was the climactic scene of Fairbanks author David Marusek’s 2017 novel, “Upon This Rock: Book 1 – First Contact,” in which many strange things happened in the town of McHardy, Alaska, the site where the large Prophecy clan had obtained an old mining property on Stubborn Mountain, within the confines of Wrangell-St. Elias National Park. If you haven’t guessed yet, McHardy is a fictionalized version of McCarthy, and the Prophecy family is based on that town’s most famous recent residents, the Pilgrims. And if you think the actual Pilgrim saga was strange, try adding space aliens, zombies, and demons to the mix. That’s just the start of what Marusek has done with this series that has recently spawned a second volume in what has to be the weirdest Alaska story ever. 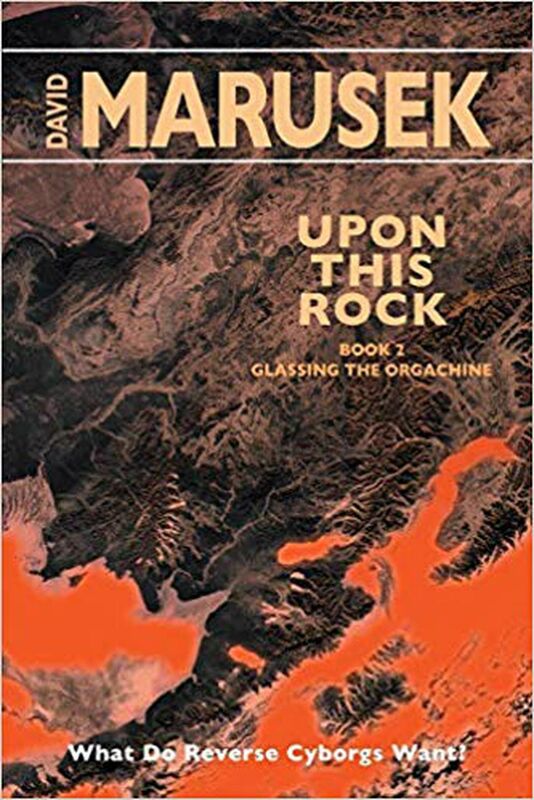 “Upon This Rock: Book 2 – Glassing the Orgachine” picks up where the first installment in the ongoing trilogy left off. And for those who missed that book, it left things in quite the mess. The story is too complicated to summarize in full, but the essential outline is that some sort of brilliant light came down on the snow during a winter’s night, viewed both by the Prophecy family’s patriarch, Poppy, and by Jace Kuliak, a local park ranger. For Poppy it’s an apocalyptic sign from God. For Jace it has to be aliens. Much of the first book was devoted to introducing the Prophecy family, and Marusek used this as an opportunity to lampoon the disorder the Pilgrims created in McCarthy during their brief but highly publicized residency. One could question the ethical decision of taking such blatant liberties with an actual family, especially one in which serious crimes were committed and everyone but the perpetrator was a victim. But Marusek did cast a sympathetic picture of the children, and in this second volume they begin to assert themselves against their tyrannical father. From the standpoint of mocking apocalyptic religion, however, the scenario is comic gold, and Marusek mines that angle well in both books, adding extra laughs via a similarly deranged governor named Vera Tetlin, an obvious Sarah Palin stand-in who’s as bonkers as Poppy Prophecy (a brief appearance is also made by yet another nutcase, this one clearly modeled upon failed political candidate Joe Miller). For Alaskans weary of watching the march of madness forever worming its way through the state’s political culture, the satire is priceless. But the story is more important, and on that measure, Book 2 actually holds up better than the first. Having gotten the Pilgrim mockery out of his system, Marusek gets down to the job of taking the family’s main characters, as well as the hapless and not-very-bright Jace, and watching them react to the escalating insanity developing around them in a tiny town cut off from the world, where going a bit loopy in the winter is not unheard of to begin with. As the story progresses this time, Jace makes contact with the alien who landed in his back 40. It turns out the creature is stranded, and wants to employ the ranger to help him gather the energy needed to launch himself back off the planet. Oh, and by the way, there is a race of sentient machines on its way, determined to destroy the Earth. But that isn’t the alien’s problem. Or is that what is really happening? It’s hard to say, since one of the Prophecy daughters, Deuteronomy (who goes by Deut), has been having visions of Jesus, the Archangel Gabriel, and Heaven. Perhaps this is the End Times. As with the first book, Marusek isn’t fully letting on. What we do know is that the alien and Gabriel are directing Jace and Deut toward each other, and the atheist ranger and the devout daughter are in the process of falling in love while being tasked by their respective advisors with saving the world, which apparently only they can do. If it sounds confusing, it is, but Marusek holds it all together and moves the plot along quickly. Where the first book bogged down a bit in rehashing the Pilgrim story, this one is an original work of science fiction/fantasy where little time is wasted. It’s also a chance for Marusek to wrestle with deeper philosophical questions than he did the first time out. The electronic version includes sidebars where he explores such questions as the relationship between men and machines — especially when they become combined in one body, the evolutionary origins of the human instinct toward religion, and even the creation story itself. Plenty of other cultural detritus get picked up by Marusek and given a healthy swatting. Right-wing paranoia, obviously, but academic types also make an appearance, and they get their stuffing removed as well. The military types passing through don’t inspire confidence. And Alaskans especially will appreciate Marusek briefly relocating the action to the HAARP facility, the target of endless online conspiracy theories. Social media also gets hammered. And there are countless sly references to past science fiction works, some obvious, others subtle. The aliens don’t fare much better. The body of the one who makes contact with Jace, we are told, “had a vague sausage vibe, with greenish, slightly greasy casings for skin, stuffed with lumpy innards." It’s hard to take such an entity seriously, but with an Earth-extinguishing event on the horizon, there are more important concerns. As with Book 1, “Glassing the Orgachine" ends on a cliffhanger. Marusek churned this one out barely 18 months after the first. Hopefully the conclusion won’t be long in coming.